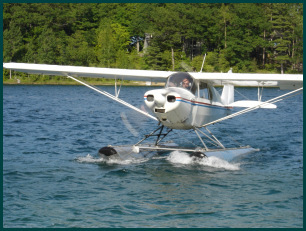 Seaplane rating for $1,195 in 2 days in beautiful, scenic northern Michigan. Learn the stick and rudder skills of seaplane flying while enjoying the beauty of the area. Bring your family with you for a great vacation while doing the most enjoyable rating you will ever get. The seaplane is located on an inland lake, 6 miles from Traverse City MI, in the middle of 3320 square miles of lakes and bays. Cost $1,195 + Examiners Fee - Payment due upon completion of check ride. Local FAA examiner's fee is extra ($500). All arrangements for your check ride will be made for you. Call or email Tom Brady to schedule your Seaplane training. Plan on 2-3 days to be in the area. Read course material that will be mailed to you. Verify weather conditions with Tom Brady prior to your arrival.